Description & Enhancement:GST ERP Software [On-premises software, Windows] •	Purchase Scheduling •	Reorder level and consumption rate calculation Deciding the financial week before the next financial week. In order to avoid penalty because of delay of paying Tax – GSTGSS – shows a daily reminder every month – till the Taxes are paid. GSTGSS prints Packing List Labels for easy posting or Courier and Transport. Supply on approval on pre-approved frequency (Daily / weekly/ monthly/ yearly) of delivery is a major module in GSTGSS. GSTGSS helps in supply on approval using daily reminders – else it will be impossible to remember who wanted what and when? GSTR1 and GSTR3B cross checking is automatic in GSTGSS. User can customize – what to print and what not to print on Invoice in GSTGSS Software. GST Laws are implemented so that the business person does not make a mistake out of ignorance. User can handle different pricing for different customer for any item in GSTGSS depending on customer type or on bulk discount. GSTGSS Tracks part payment, Part Receipts and part supply. GSTR1, GSTR3B and EWayBill can be uploaded from GSTGSS – saving you the fee payable to a third party to create JSON format file and then upload. GSTGSS handles multiple discounts on any item. Impact of Effect of offers are implemented in GSTGSS (Tax calculation for free items). Our Software Code is Pre-Scanned by AVAST Anti-Virus (Licensed Version) and each Application is VeriSign Signed Shareware 35 days of ‘No-Obligation’, fully functional, single user, Anti-Malware scanned and Symantec code certified free trial to try before you buy. 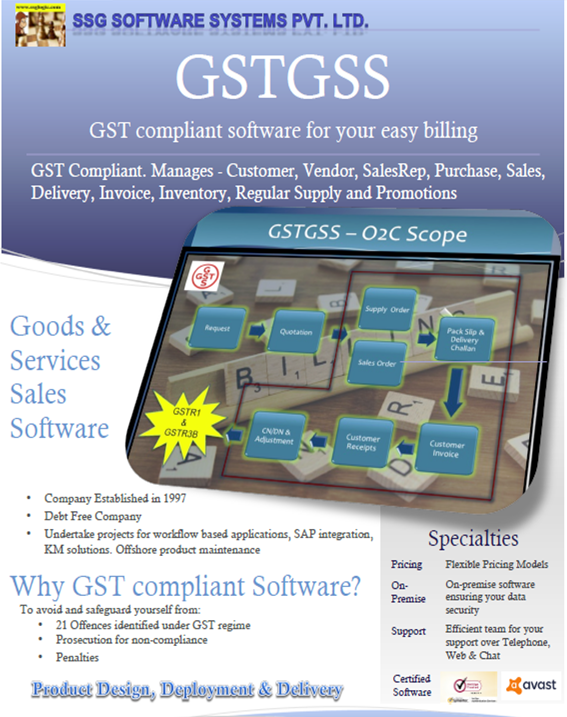 GST-Compliant Goods and Services Sales Software. Companies are running their bussiness because they are skilled in that technique,operations and know how. Every bussiness need not be master in the GST Laws and controls. Neither, they have to spend huge money hiring experts to advice every step of bussiness change to comply with GST laws. Simply run your bussiness using our product, partner with us for your GST ERP billing software at a very afordable cost. Get GST Billing software Implementation support. Manage Sales Orders, Supply Orders, Purchase Orders with cheap cost. Track input tax credit on your purchases and utilize ITC. GST Billing Software is used to serve the purpose of AMC Management Software, Retail Billing Software, Factory Automation Software , Service Billing , Regular Supply Billing with affordable price. GST Impact on Manufacturing Sector and Solution through GSTGSS Software. Warehouse in one state to warehouse in a different State of the same company is considered a "Sale" in GST . Hence, availability of input tax credit on state supply of goods and services may lead to warehouse re-engineering that can remove an extra level of warehousing in the supply chain, hence leading to greater cost benefit. Warehouse management be based on arbitrage between varying VAT rates across states, will no longer work out. Removal of multiple valuations will create simplification: The old tax regime subjects manufactured goods to excise duty, which is calculated differently in different states. While some states calculate excise duty based on transaction value, others calculate it based on quantity. Most manufactured goods’ excise duty is currently considered on MRP valuation. This creates great confusion in valuation methods. GST will usher in an era of transaction-based valuation, making calculation of tax much simpler for the manufacturer. Improved cash flows: Under the new tax laws, manufacturers can claim input tax credit on input goods, which seems to be a positive sign for cash flow. More stringent and elaborate transaction management: GST aims to achieve better tax compliance. To make this possible, manufacturers must work towards streamlining existing transactions; this means additional resources and costs. For example, under GST, credit in respect to an invoice can be taken only up to one year of the invoice date. Also, the provision of reverse charge means that the liability to pay tax falls on the recipient of goods/services instead of the supplier. The payment of reverse charge is dependent on the time of supply (30 days from the date of issue of invoice by the supplier in case of goods and 60 days for services).These changes will require manufacturers to carefully assess and track their supply processes, especially the timelines. This may mean hiring a better skilled compliance workforce, and better systems and software. More legal considerations will also mean more costs. The implementation of GST will also signal a move away from the producer State tax system to a consumption State tax system. Producer States will have a lower financial incentive to offer such concessions, as GST will only be credited to the State where the supplies are consumed, as opposed to the present situation where the producer State is credited with central sales tax on inter-state sales. Under the present indirect tax regime free supply of goods are not subject to VAT. The Model GST Law stipulates that specific transactions without consideration would also be treated as supplies. Accordingly, free samples are subject to GST. The Model GST Law stipulates that post supply discounts are to be excluded from the transaction value, provided such discounts are known at or before the time of supply of goods and are linked to the invoices for such supply. Supply under the GST Model Law includes self-supplies such as stock transfers and branch transfers. Under the GST regime, GST is payable by the manufacturer at the transaction value, and is creditable for all subsequent resellers up to the final consumer. Accordingly, the unnecessary tax burden of the MRP regime will no longer be relevant. Under the present indirect tax regime, the manufacturing sector is able to set-off most input taxes levied in the production value chain. However, Central taxes cannot be set-off against State taxes and vice versa. This often leads to a situation where manufacturers are unable to set off excess credit of central or state levies. Further, central sales tax paid on inter-state procurements is also not creditable and are costs for the company. Another issue faced currently is the cascading of taxes at the post manufacturing stage. Dealers, retailers etc. are subject to taxes on their input side which are not creditable (service tax on input services, excise duty on capital goods). This leads to an increase in the cost of goods, ultimately affecting the competitiveness of Indian manufactured goods vis-à-vis imports. All of the above issues are addressed under the Model GST Law, which permits tax set offs across the production value-chain, both for goods and services. This will result in a reduction of the cascading effect of taxes and bring down the overall cost of production of goods. The inception of GST which is based on the principles of a simplified rate structure and minimization of exemptions will significantly reduce disputes regarding classification of products. Registered person is required to issue Tax Invoice before or within 30 days from the date of providing of services. At the time of receipt of Advance, person is required to issue Receipt Voucher. If Supply not made against advance receipt, then person is required to issue Refund Voucher. Invoice will be issued by recipient if supply received from UNREGISTERED DEALER OR UNDER RCM. Payment voucher will be issued by recipieint at the time of making payment againt supply by unregistered dealer or under RCM. If supply of services ceases before completion, invoice is required to be issued to the extent of the supply done. If the goods are sent or taken or approval, invoice shall be issued at the of acceptance or six months from the date of removal. Amount of tax is required to be mentioned separately on the invoice..
(2) It can not be issued later than september following the end of the financial year . (2) It can not be issued later than september following the end of the financial year.